A classic Blue Ridge Parkway hike, this trail continues onto National Forest land to climb to the summit of one of the area's most well-known peaks, which lends its name to numerous other things throughout the region. Mount Pisgah is part of the original tract of land sold by the Vanderbilts to the federal government to establish Pisgah National Forest. 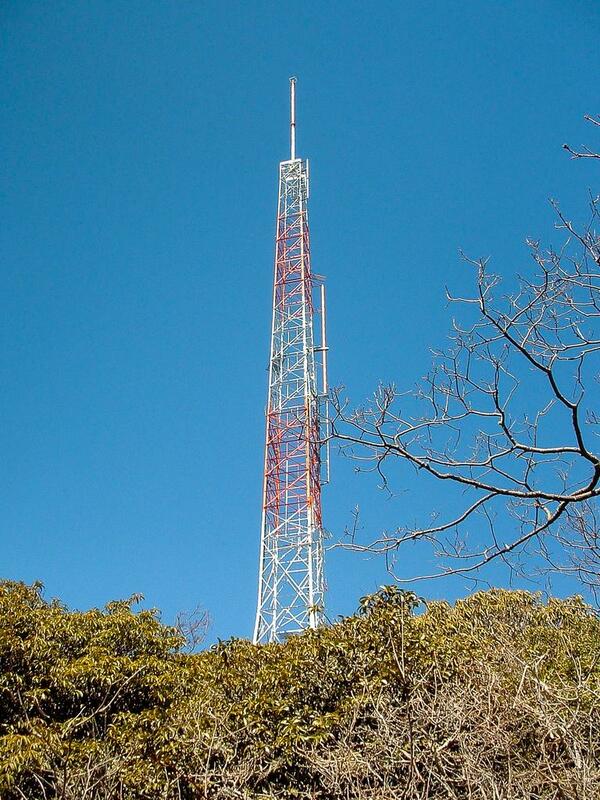 Easily visible from most of downtown Asheville, Mount Pisgah's 5721 ft summit supports the transmission tower for WLOS-TV, channel 13. 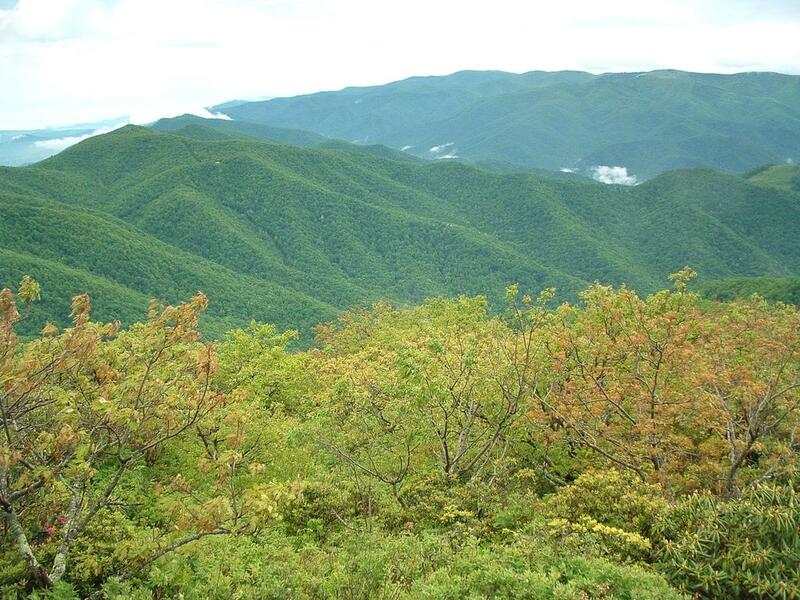 The trail itself is a rocky, steep climb through Northern hardwood forests, and rhododendron and mountain laurel tunnels, to the summit where 360 degree views await! 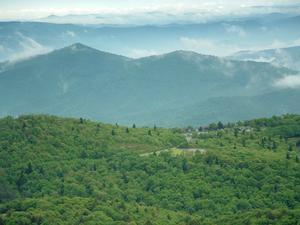 From Asheville, take the Blue Ridge Parkway south to the Mount Pisgah Parking Area, on the left, at milepost 407.6. Park at the second parking area; the first is for the Buck Springs trail. The trail starts at the back of the parking area behind the large sign board. At the parking lot, you are just shy of 5000 ft in elevation and you are in the midst of the high-elevation northern hardwood forest. 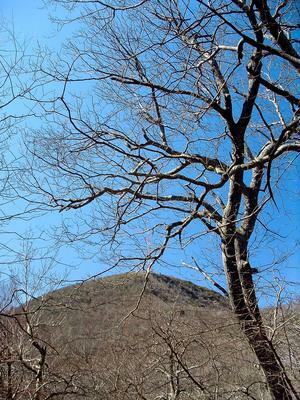 You will be in this forest, largely dominated by oaks, all the way to the summit - although you will see some birches, maples, beeches, spruce, and many other less common species mixing in at times. 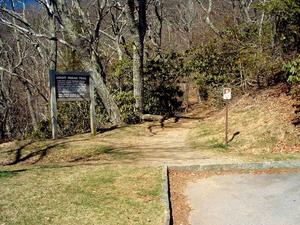 The beginning of the Mount Pisgah trail as seen from the back of the parking area given the same name. In the first half of the hike, you will gain about 200 ft in elevation. The other 550 ft are gained in the second half, so the second half is much steeper. The entire hike is very rocky. There are some rooty and wet sections as well. The trail begins a gentle climb along the slopes of Little Pisgah Mountain. 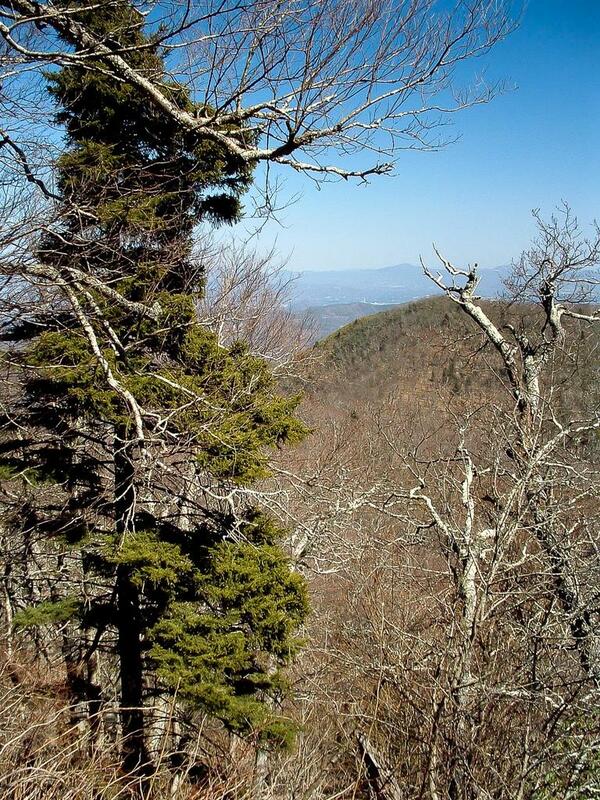 The trees are a bit taller here than on the summit, but still quite gnarled and twisted. Some of them are hollow, and you may see animals (or people!) inside. As usual in these mountains, the sound of a rushing stream not far away can be heard. This particular stream is in the valley to your left as you wrap around the upper part of its watershed. This stretch of trail offers wintertime views of Mt. Pisgah itself. 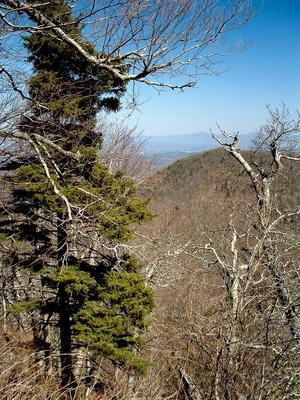 In the summer, the cool, high-elevation woods offer a nice respite from the heat even if you don't hike all the way to the top. The Mount Pisgah trail reaches the ridgeline amongst gnarly oak trees. 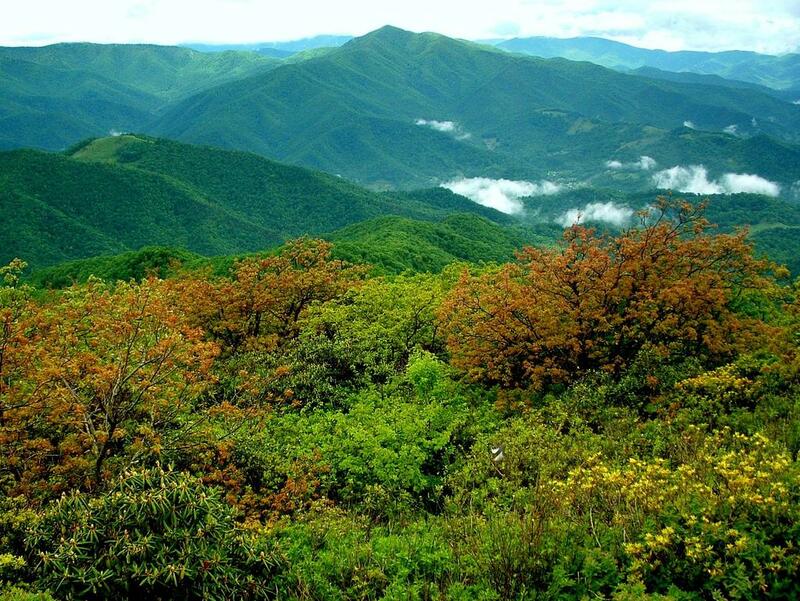 You will reach the crest of the ridge between Little Pisgah Mountain and Mount Pisgah itself, and begin the more difficult part of the climb. This is where many turn back. The trail ahead travels up the ridgeline for a while where it becomes moderately steep. 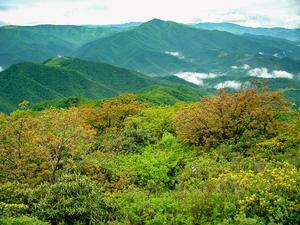 Then, you'll slip off the south side of the ridge onto on a very steep section of trail. There are some difficult step-ups and off-camber rocky sections. This is the steepest part of the climb. 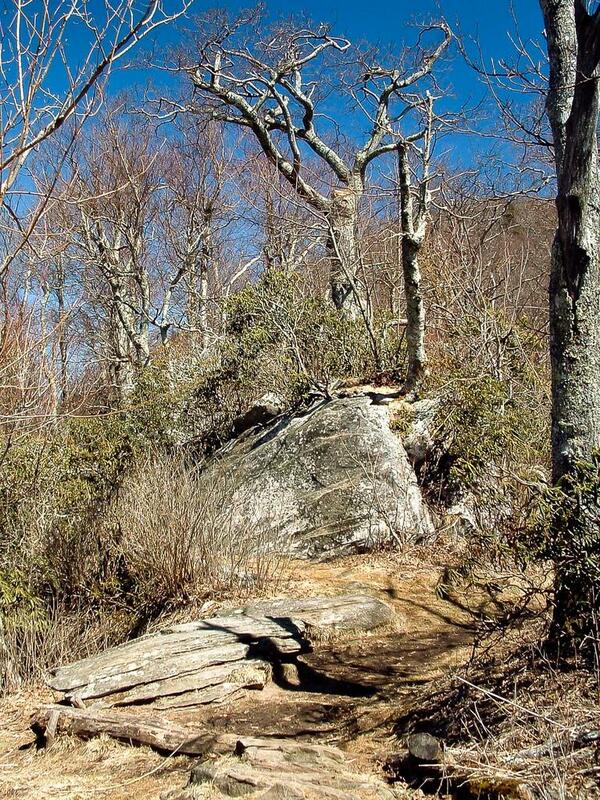 After the climb moderates some, the trail will enter a long mountain laurel tunnel. It's not as steep, but it is still very rocky - almost one big rock staircase. The trail achieves a side ridge, switches back and then follows this ridge to the top of the summit, making a few turns through a stand of American Beech trees. 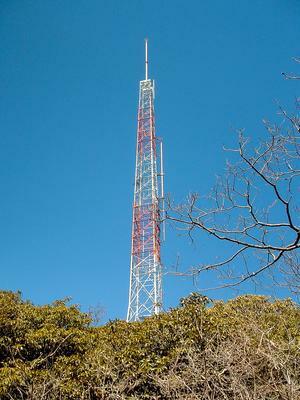 At the summit, you'll find the transmission tower for WLOS-TV, channel 13, and an observation deck. This kind of ruins any feeling of being in the wilderness, but the view is spectacular. 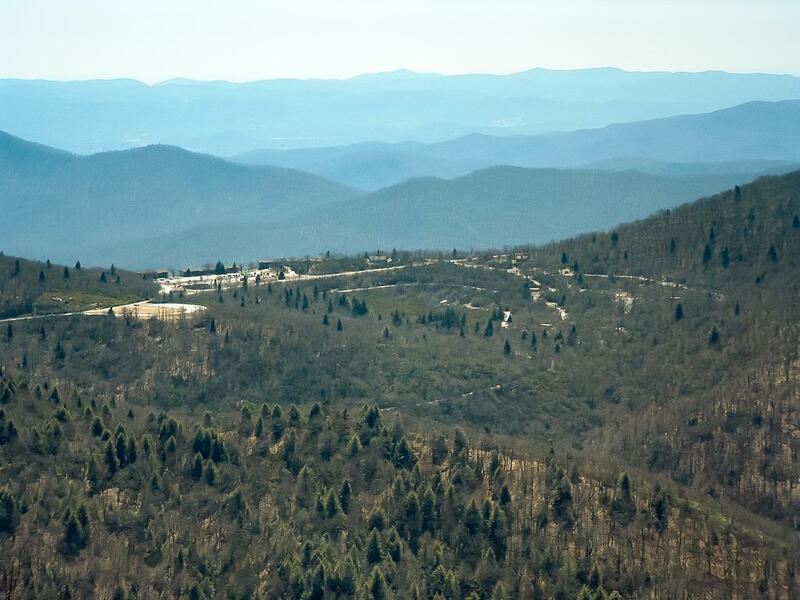 On a clear day, you can see the parking area, the Campground & Pisgah Inn to the east; the Shining Rock Wilderness Area to your west (with Cold Mountain at its northern end); the Great Smoky Mountains farther to the west; and to the north, the city of Asheville, Craggy Mountains, and Mount Mitchell. 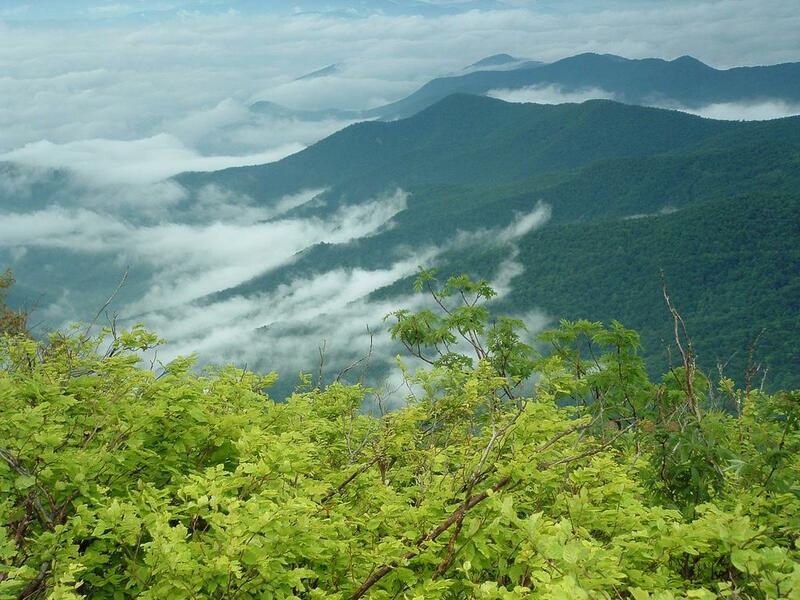 View of Cold Mountain from the summit of Mount Pisgah after a spring rain. When you're finished soaking up the views, return to your vehicle on the same path. 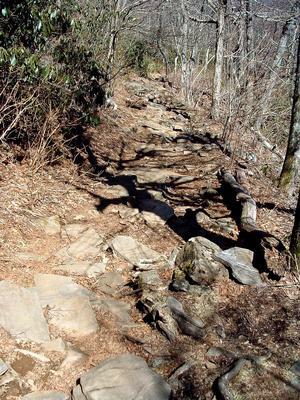 Connecting Trails: Those staying at the Pisgah Inn can walk from the Inn north on the Buck Spring trail for 1.4 miles, past the old Buck Spring Lodge site, to the Mt. Pisgah Parking Area. 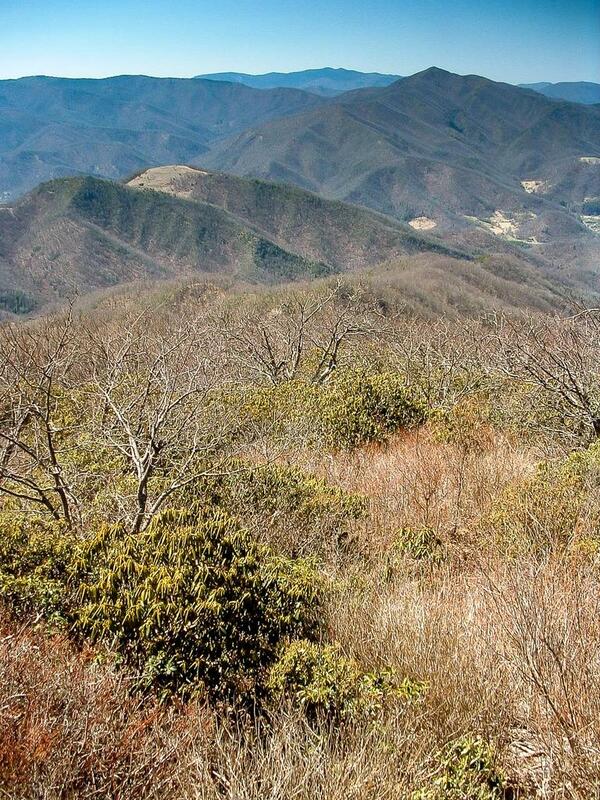 From there, you can hike on up Mt. 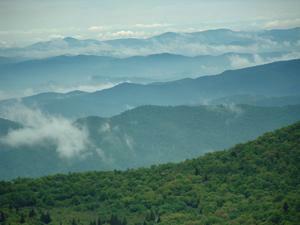 Pisgah itself. 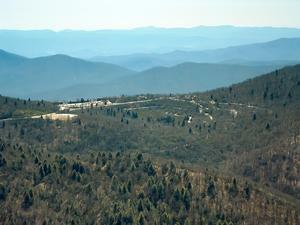 From the parking area, the Shut - In trail also heads north along the Blue Ridge Parkway toward Asheville. 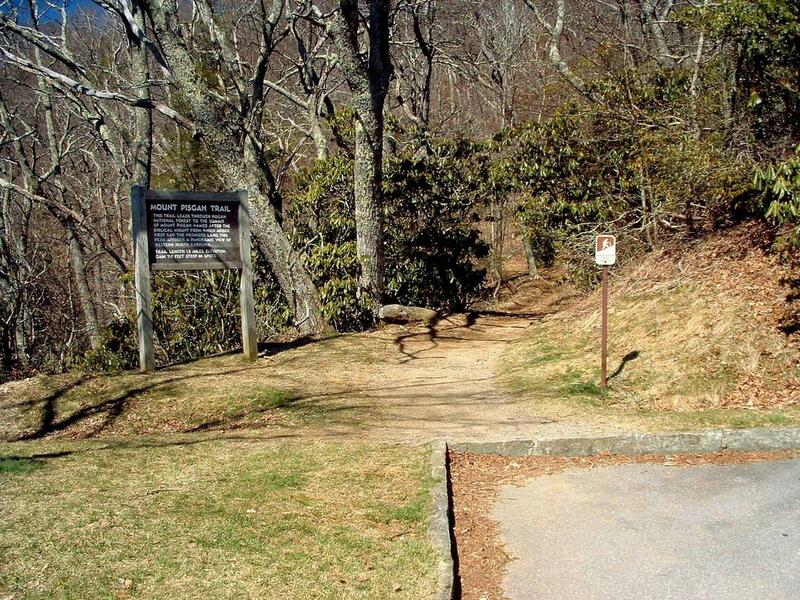 The Shut-In trail is the original route from the Biltmore Estate to the Buck Spring lodge, built as a mountain getaway for George Vanderbilt, owner of the famous Biltmore. 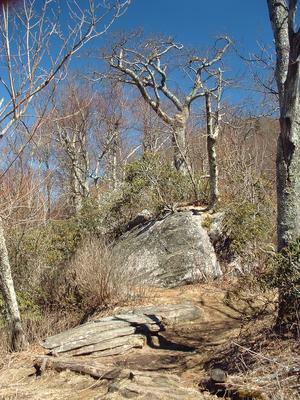 The North Carolina Mountains to Sea Trail follows both the Buck Spring and Shut-In trails, and connects to trails in Pisgah National Forest in both directions. Jordan M. said: Tim - no links in comments yet, but you can still copy 'n paste ;) But we're going to work on getting a much better comments system soon. Thanks for the info! keller fox said: FYI An intruder vandalized the home on top of little Mt. 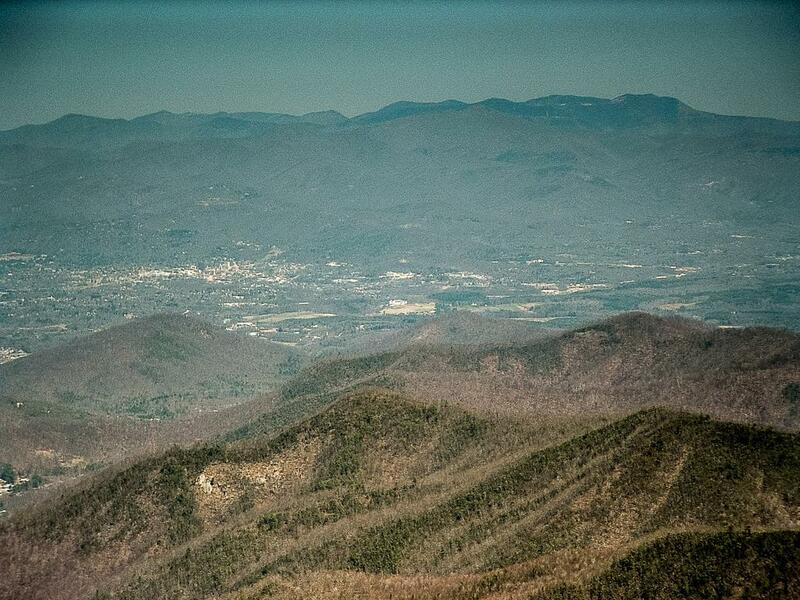 Pisgah last week, possibly on Saturday, 3/4.